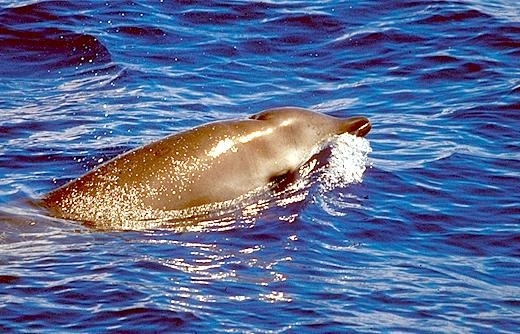 Gervais’ Beaked Whales are members of the beaked whale family called Ziphiidae. Sometime between 1836 and 1841, Captain Abel Vautier came across a large animal floating at the entrance to the English Channel, its body covered by swarming gulls. He cut the head off and transported it to Caen, France. 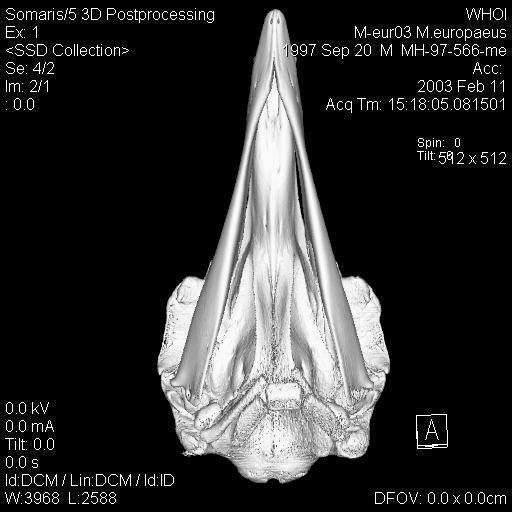 The specimen somehow made its way to the French scientist Paul Gervais, who described it as a new species in 1855. 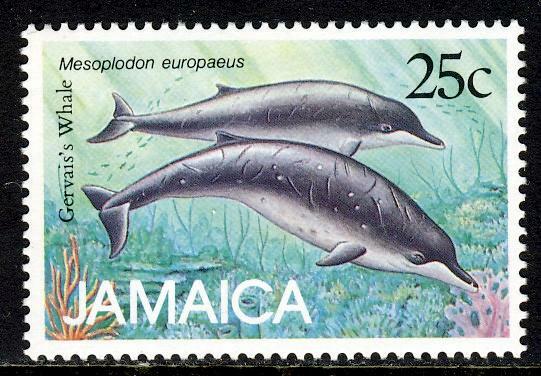 For several decades, this remained as the only known specimen of this species. The species’ identity was confirmed by the discovery of two specimens from New Jersey, an immature male captured near Atlantic City in 1889 and an adult female found stranded at North Long Branch in 1905. 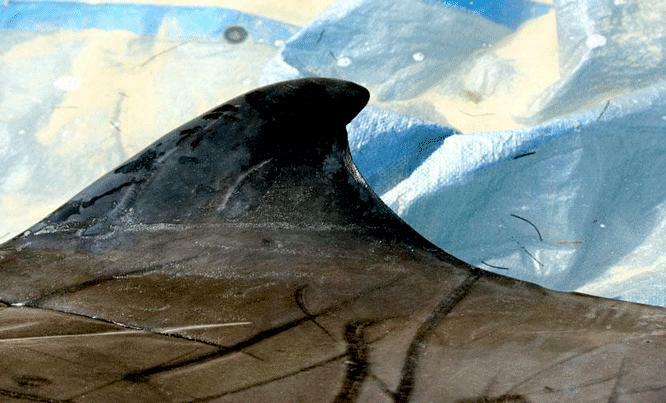 As adults, Gervais’ Beaked Whales can reach estimated lengths of about 15-17 feet and weigh at least 2,640 pounds. Females may be slightly larger than males. Males can be distinguished from females and juveniles by a pair of visible teeth that erupt from the front portion of the bottom jaw. Females & juveniles have teeth as well, but they remain hidden beneath the gum tissue of the mouth. 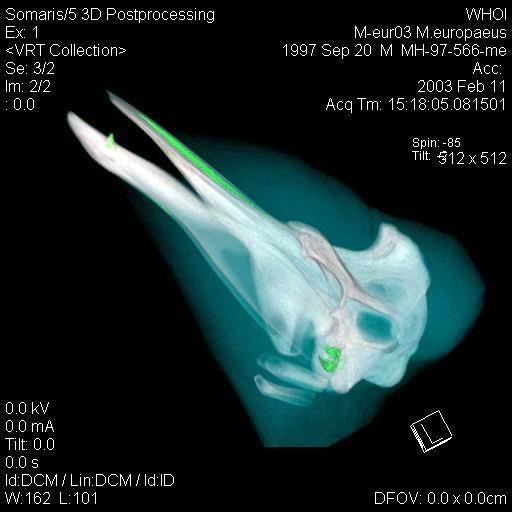 The jaw line is typically straight or slightly curved. 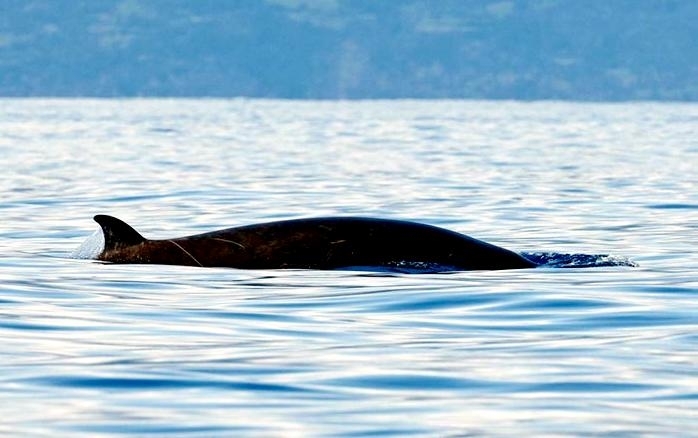 Gervais’ Beaked Whales have a relatively small to medium size body with a moderately long beak and an indistinct sloping melon with a small, triangular, wide-based, slightly falcate dorsal fin located far down (about two-thirds) the animal’s back. The coloration of the body is dark gray or bluish to black with a paler ventral side. Animals tend to become darker as they age. Mature males may also have linear scars from battles over females. 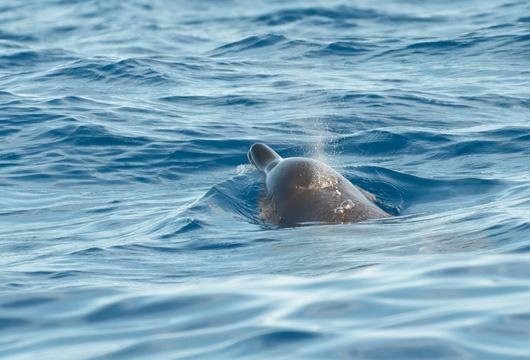 This species of beaked whale is difficult to observe and identify at sea due to a low profile at the surface and a small, inconspicuous blow. 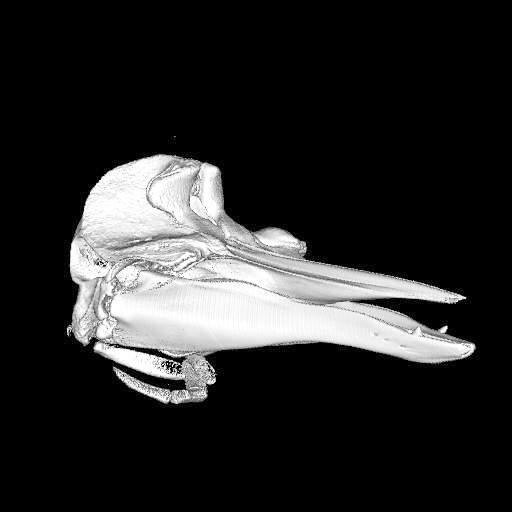 Many species of beaked whales especially those in the genus Mesoplodon, are very difficult to distinguish from one another even when dead. 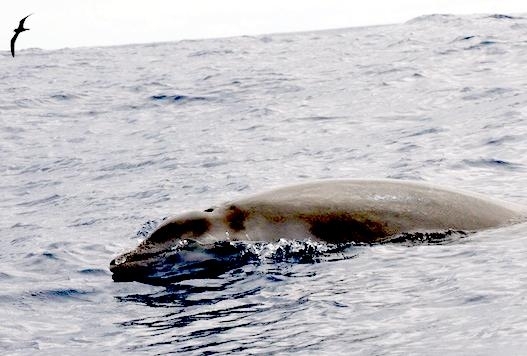 At sea, they are challenging to observe and identify to the species level due to their cryptic, skittish behavior, a low profile and a small, inconspicuous blow at the water’s surface; therefore, much of the available characterization for beaked whales is to genus level only. 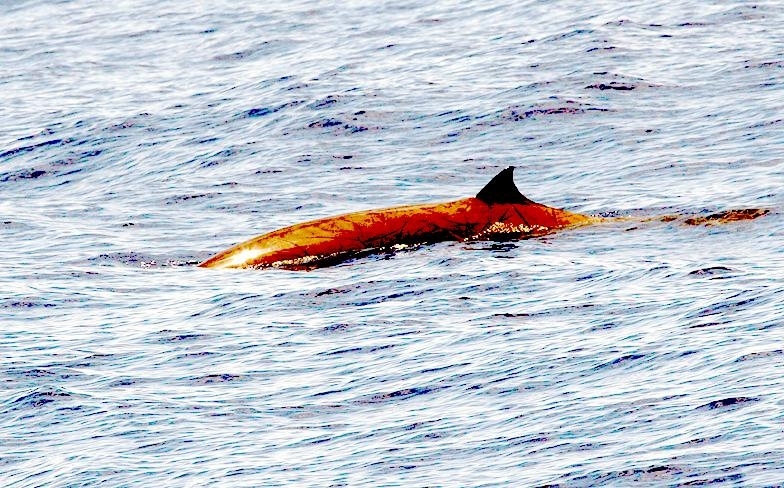 Uncertainty regarding species identification of beaked whales often exists because of a lack of easily discernible or distinct physical characteristics. 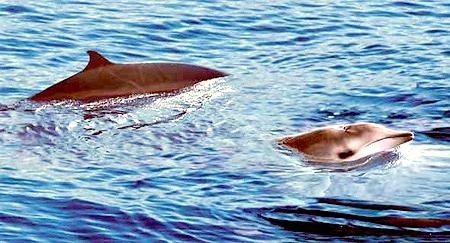 Gervais’ Beaked Whales are usually found individually or in small closely associated social groups. While diving, they use suction to feed mainly on cephalopods, shrimp and small fish in deep water. Females may become sexually mature at 15 feet. A sexually mature female will give birth to a single newborn calf that is about 7 feet long and weighs about 176 pounds. 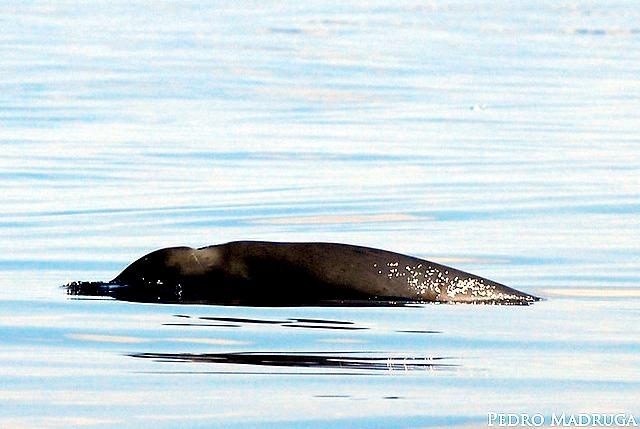 The estimated lifespan of this species is at least 27 years, but may be up to 48 years. 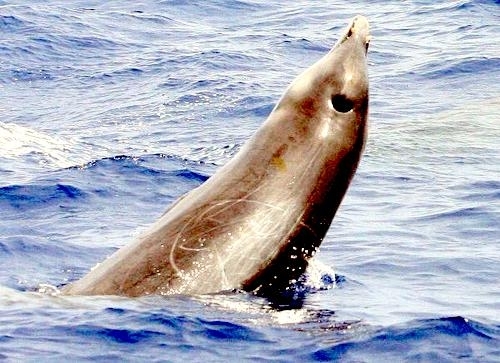 Gervais’ Beaked Whales prefer deep tropical, subtropical and warm temperate waters of the Atlantic Ocean, but are occasionally found in colder temperate seas. 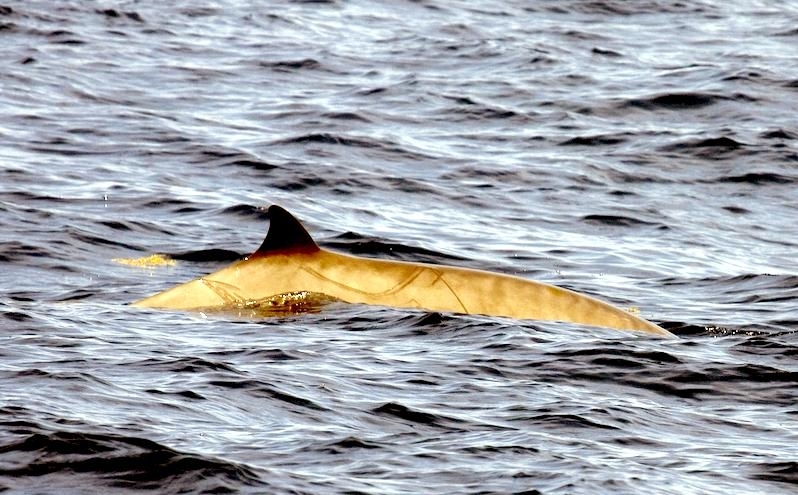 Gervais’ Beaked Whales are distributed throughout deep, warm waters of the central and north Atlantic Ocean. This species is thought to occur mostly north of the equator. Their range includes the English Channel, Europe, Canaries Islands, Western Africa, Brazil, Caribbean Sea, Gulf of Mexico and the eastern north Atlantic. There are no known seasonal movements or migrations for this species. 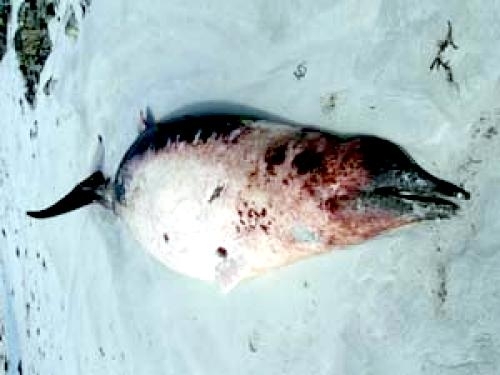 For management purposes, Gervais’ Beaked Whales inhabiting U.S. waters have been divided into the Western North Atlantic stock and the Northern Gulf of Mexico stock. 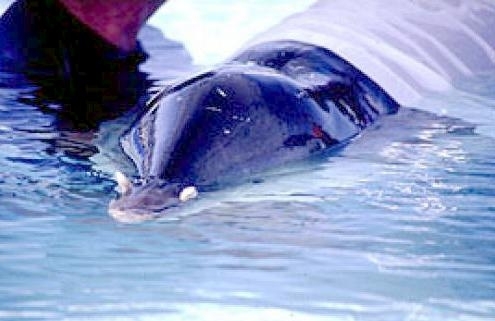 The estimated population for Blainville’s and Gervais’ Beaked Whales in the Northern Gulf of Mexico is 75-100 animals. This stock is considered strategic due to the uncertainty surrounding its status. 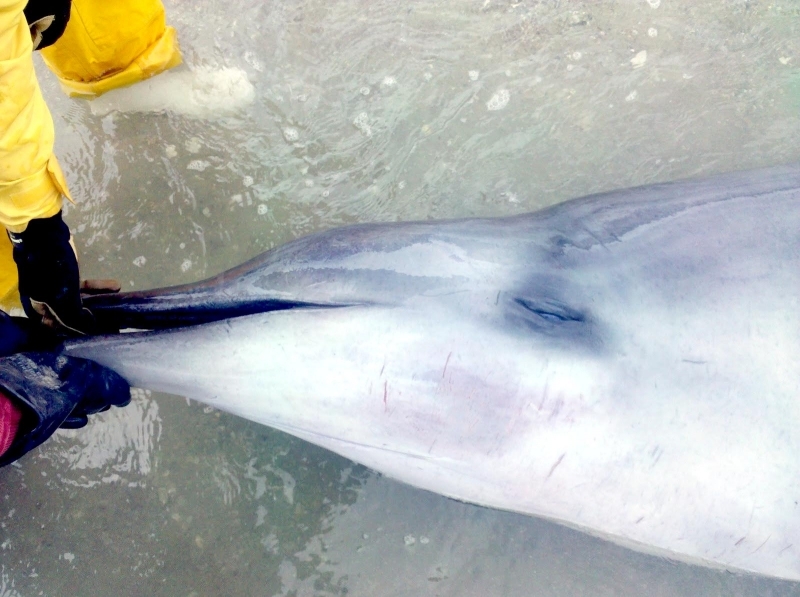 No current population estimates are available for the Western North Atlantic stock of this species of beaked whale, but based on the number of strandings, they may be fairly common along the U.S. Atlantic coast. There are insufficient data to determine the population trends for this species. 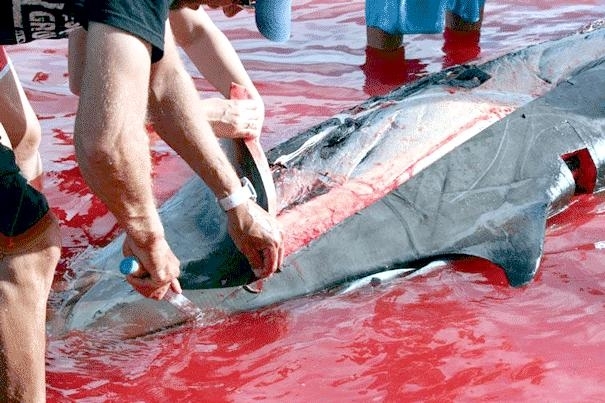 Gervais’ Beaked Whales have been incidentally taken as by-catch in fishing gear, such as pound nets off the U.S. Atlantic coast and potentially in drift-nets & gill-nets. 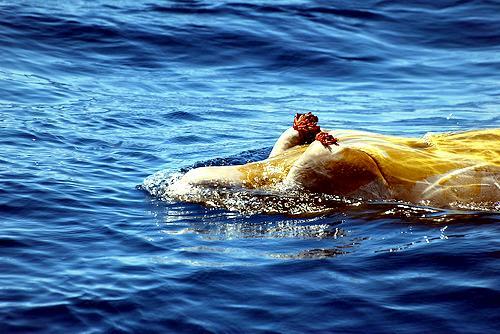 This species may be captured in the Caribbean Sea for food. 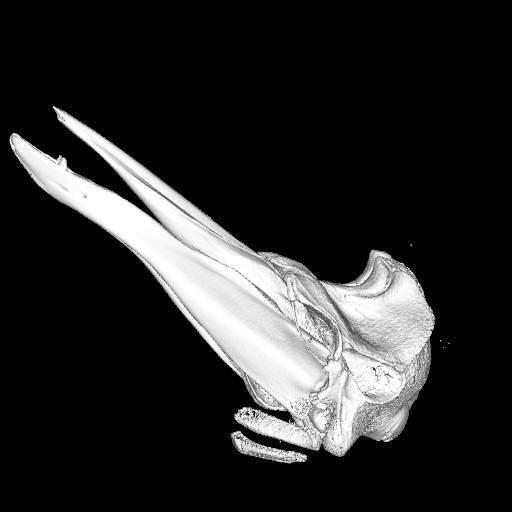 This species of beaked whale may be sensitive to underwater sounds & anthropocentric noise. 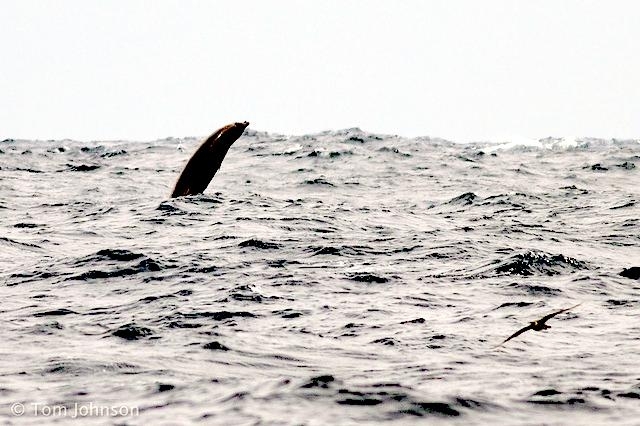 Anthropocentric noise levels in the world’s oceans are an increasing habitat concern, particularly for deep-diving cetaceans like Gervais’ Beaked Whales that use sound to feed, communicate & navigate in the ocean.